MYZONE puts the responsibility on the pedestrian by attaching a small receiver to their helmet. If they enter a machine’s exclusion zone (distance for this can vary from machine to machine) their receiver will vibrate, alerting them that they are in a dangerous area. The machine operator is free to work without any distraction. 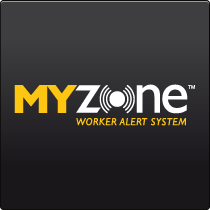 We are starting to use MYZONE on our jobs and have found it to be an excellent system, with great potential to bring accidents on site down to a minimum. We are certain that in the future it will be the norm on every rail site.